A multimillion-dollar DARPA grant to Luke creator DEKA will support research to give Luke wearers the ability to actually feel things. A program to develop a prosthetic arm with a sense of touch just got a nearly $7 million boost from the Defense Advanced Research Projects Agency, or DARPA. The contract with DEKA Integrated Solutions Corp., a subsidiary of DEKA Research and Development Corp. (Manchester, NH), will fund research into improving DEKA's prosthetic arm, nicknamed the Luke Arm after Luke Skywalker. DARPA wants Luke wearers to actually feel sensations with the robot arm and hand. DARPA announced the Hand Proprioception and Touch Interfaces (HAPTIX) program in April, following President Obama's January State of the Union speech urging development of more sophisticated prosthetics for combat veterans. DEKA will train HAPTIX and Revolutionary Prosthetics Follow-on Studies (RPFS) staff on how to set up and operate the arm systems, and provide technical support, maintenance, and repair during the studies. The arm runs on two different controlling mechanisms. Sensors in the arm-wearer's shoes can be manipulated to control it; and electromyography sensors can read nerve signals in the muscles left in the stump. The arm is also configurable with different modules for different levels of amputation. There's a full arm system, or the Luke can be configured without a shoulder module if the amputation is between the shoulder and elbow. If the amputation is between the elbow and the wrist, the elbow module isn't needed. The Luke has six preprogrammed grip patterns in the hand that users can select using the controls. Even with all these advances, Medicare and most private insurers appear to be unpersuaded when it comes to covering such advanced prosthetics for patients, according to the Boston Globe. One prosthetic maker estimated the Luke's price tag could be well north of $100,000. HAPTIX plans to conduct a yearlong, take-home study to provide the government with the data to seek FDA approval and make the arm system available to more patients. FDA gave de novo approval to the DEKA arm system May 2014. 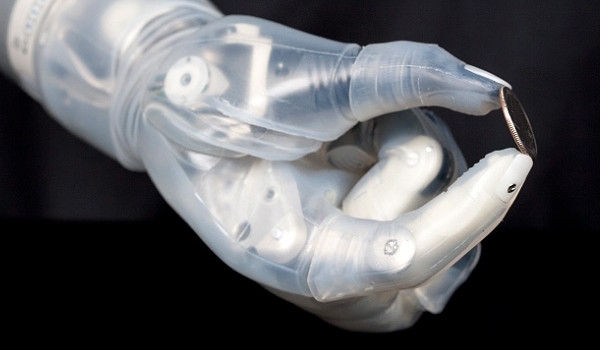 DARPA wants the studies to improve the chances that Medicare and Medicaid will cover the costs of the prosthetic arms. DEKA beat 59 other applicants to win the continued DARPA contract support. Luke arm developer Dean Kamen, who also invented the Segway electric scooter, started the project with $18.1 million from DARPA. Kamen has said in the past that DEKA will manufacture the arm itself if it can't find a company interested in doing it, though that is not Kamen's preference. Kamen could not be reached for additional comments on Tuesday.